The City of Toronto is planning to construct a new storm trunk sewer system in the Fairbank-Silverthorn area. 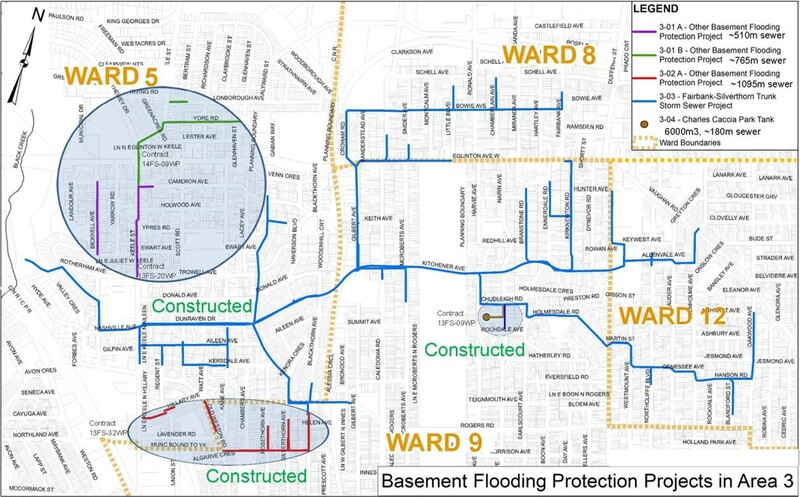 This new sewer system was recommended by the Investigation of Chronic Basement Flooding – Study Area 3 Environmental Assessment, completed in 2010. This work is part of the City of Toronto’s Basement Flooding Protection Program to help reduce the risk of future basement flooding. The preliminary design for the project completed in 2015. The main tunnel size was increased due to additional storm sewers required in the area. The preliminary design also identified significant property impacts. Due to increased cost and risks due to underground utilities and anticipated timelines for property acquisitions, the City engaged a third party consultant to peer review the design and reduce property impacts. Only sub-surface easements are now required. The City also changed the delivery model from design-build to design-bid-build. This will allow design to be completed with detailed utility investigation and time to acquire sub-surface easements. Construction for this project will occur between 2021 to 2025 through multiple construction contracts. Find a larger version of the Fairbank Silverthorn Storm Trunk Sewer System 2019 Map here. In January 2019, City awarded the detailed design, services during construction and post construction assignment. Field survey and investigations on City roadways and parks will commence in Q1-2019. City staff will initiate sub-surface easement discussion with impacted property owners. Construction for this project will occur between 2021 to 2025 through multiple construction contracts. Public meeting is planned later in 2019 to provide an update to area residents.